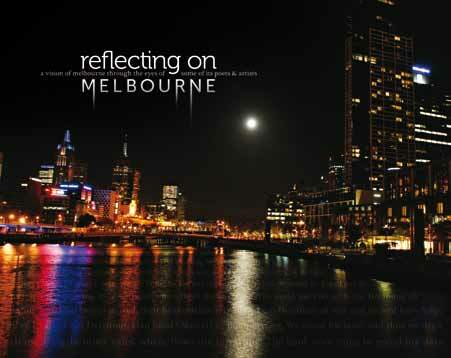 This is a book to showcase Melbourne. A fitting tribute to the city, which has been declared to be the second city of Literature in the world. Collecting poetry from all over Melbourne the editors have arranged a journey through the city for you starting with our Koori origins, taking in our rivers, our seasons and weather, our transport, our inner city life and that of the suburbs. You are given a glimpse of people’s lives and recreations. Here, in image and song, is Melbourne in all its multicultural and multitudinous, marvellous and malevolent glory. A super tram-load of poets ring the bell and, one-by-one, show their Melbourne from the city to the suburbs, from the Yarra tot eh bay – from Ouyang Yu’s bewildering winter crowing at blackbirds to …the late Lisa Bellear’s elegiac parting line on a passing fancy. And if you need a break from the poets, gaze out the tram window at the images. Ever wondered where, in Melbourne, Jesus would have been crucified? Michael Donnelly’s etchings provide the answer: Chadstone Shopping Centre. Read this super tram of poetry and see why Melbourne is a City of Literature. Click here to view a sample of the book.